Haswell update. The combination of a high-performance Core i7 quad-core processor, matte screen, and Windows 7/8 Professional already indicates that the ProBook 450 G1 wants to be a work machine. 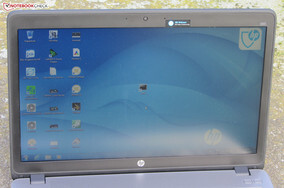 HP aims at both professional and private users at the same time. 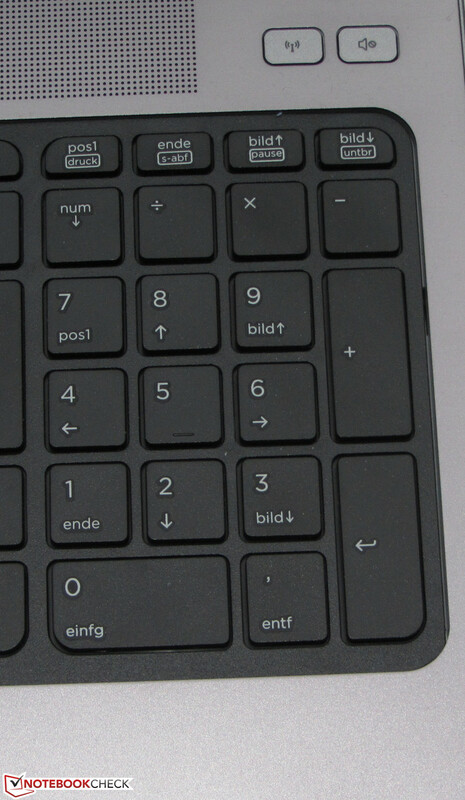 However, the company demands just under 800 Euros (~$1099) for the laptop. Our test report reveals whether the device is worth the money. HP offers a range of 15.6-inch office laptop for both private and professional use within its ProBook 450 lineup. We have tested two other members of the series in the forms of the ProBook 450 G0 H0V92EA (Core i3-3120M, HD Graphics 4000) and ProBook 455 G1 H6P57EA (AMD A4-4300M, Radeon HD 7420G). 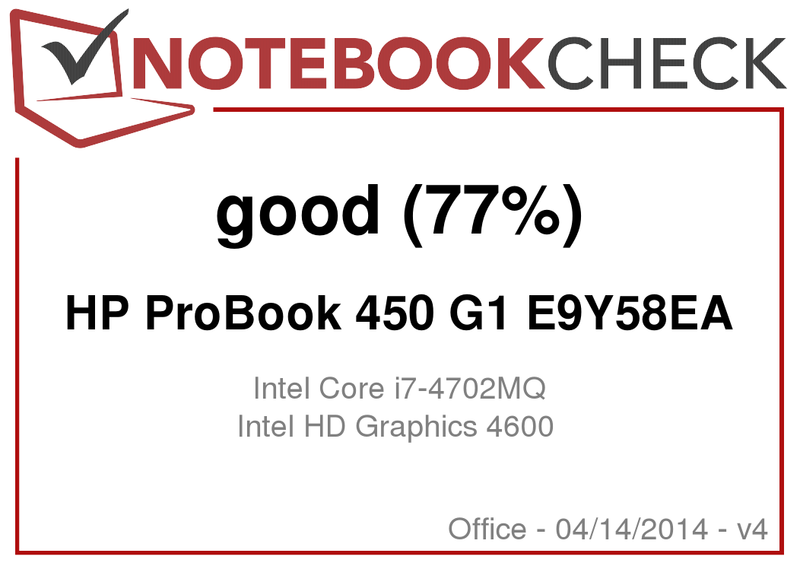 Our review reveals whether the ProBook 450 G1 can match the good impression of its relatives. We used the Lenovo ThinkPad Edge E540 (Core i3-4000M, HD Graphics 4600) and the Acer TravelMate P455-M (Core i5-4200U, HD Graphics 4400) to classify the laptop. Since the ProBook 450 G1 features the same build as its relatives, we will not deal closer with the casing, connectivity, input devices, and speakers. 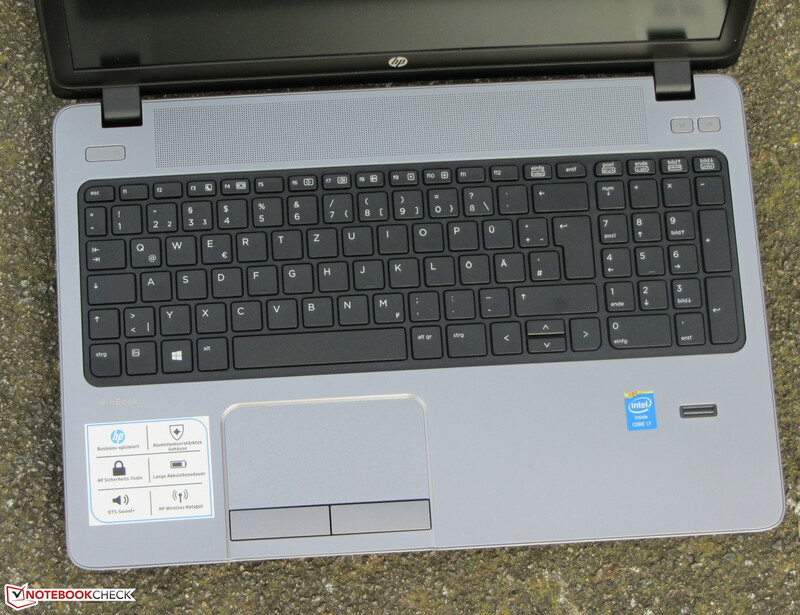 Further information can be found in the review of the ProBook 450 G0. 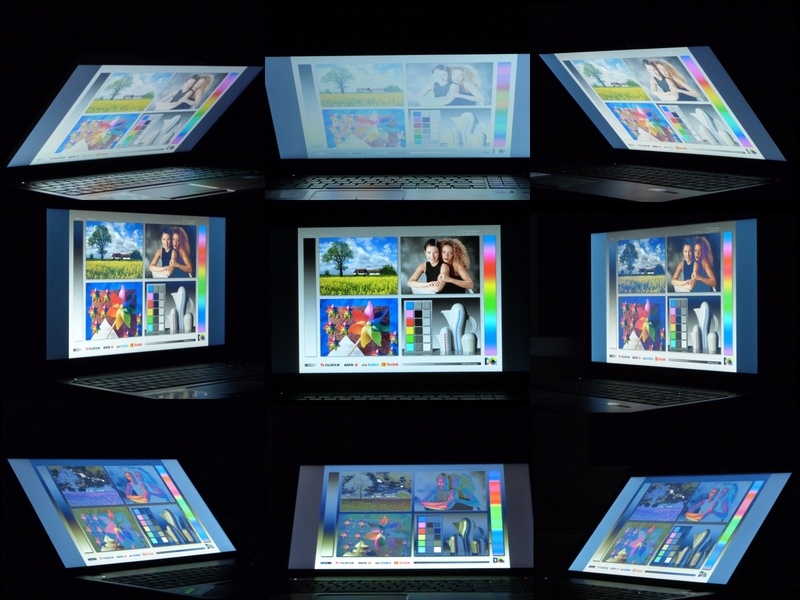 The ProBook's matte screen has a resolution of 1366x768 pixels. The screen's average brightness is 202.8 cd/m², which is in the midfield. The TravelMate (200.6 cd/m²) is on par. The ThinkPad Edge (217.2 cd/m²) achieves an only marginally better rate. Both the screen's contrast of 211:1 and black level of 1.08 cd/m² are poor. No one wants to find rates like these in a screen nowadays, and most certainly not in the screen of a laptop priced at almost 800 Euros (~$1099). However, the rates of the TravelMate (361:1, 0.54 cd/m²) and the ThinkPad Edge (289:1, 0.89 cd/m²) are not compelling either. The ProBook's screen cannot reproduce either the AdobeRGB or the sRGB color spaces. sRGB is covered by 50.2% and AdobeRGB is covered by 34.8%. These color spaces are needed, for example, in professional image editing. 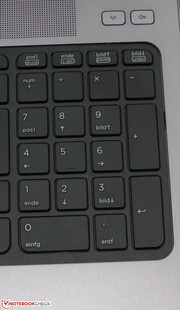 The screen's average DeltaE shift is 12.64 in its default state. No color achieves the target range of DeltaE smaller than 3. The screen also exhibits a bluish cast, which can be eliminated by calibrating the screen. We tested that. Despite the only middling brightness, the laptop can be used outdoors. The matte surface pays off here. However, overly bright surroundings should be avoided. The ProBook's viewing angle stability is on par with both the ProBook 450 G0 and ProBook 455. Changing the vertical viewing angle quickly leads to image distortions. The horizontal viewing angle is more generous, and content can still be recognized from the sides, but it dims with an increasing angle. HP offers 15.6-inch office laptops within the ProBook 450 lineup, and aims at both professional and private users at the same time. Our review sample presently costs approximately 790 Euros (~$1085), but there is savings potential. Buyers who are satisfied with a Core i5-4200M or Core i3-4000M processor, 4 GB of working memory, and a 500 GB hard drive will find the ProBook for approximately 620 Euros (~$852) or 580 Euros (~$797). The identically built ProBook 455 range offers even more affordable models that feature AMD APUs. 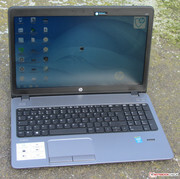 The ProBook 455 G1 H6P57EA (AMD A4-4300M, Radeon HD 7420G) that we tested costs about 470 Euros (~$646). 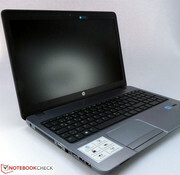 HP installs a Core i7-4702MQ processor in the ProBook. This quad-core processor is a member of the latest Haswell CPU generation. It clocks with a base speed of 2.2 GHz, which can be boosted to 2.9 GHz (all four cores), 3.1 GHz (two cores), and 3.2 GHz (one core only) via Turbo. Intel specifies the CPU's TDP with 37 watts. The processor performs the Cinebench CPU tests at full speed. Consequently, the scores are as we expected. Neither the ThinkPad Edge (Core i3-4000M, HD Graphics 4600) nor the TravelMate (Core i5-4200U, HD Graphics 4400) can compete with the ProBook. Both laptops sport a weaker processor. The system runs smoothly, and we did not experience any delays or other problems. The PCMark benchmark scores are also impressive. The ThinkPad Edge (Core i3-4000M, HD Graphics 4600) and TravelMate (Core i5-4200U, HD Graphics 4400) lag behind the ProBook because of their weaker processors. 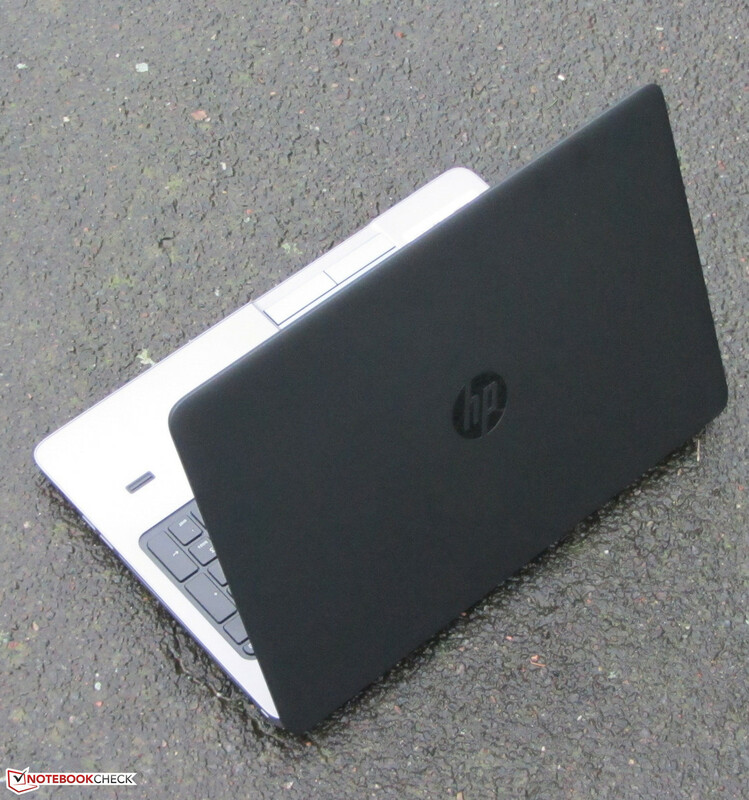 HP furnishes the ProBook with a hard drive from Seagate's Momentus line. It has a capacity of 750 GB, and spins with 5400 revolutions per minute. CrystalDiskMark recorded a read speed of 103.3 MB/s, and HD Tune delivered an average transfer rate of 82.4 MB/s. These are good rates for a 5400 rpm hard drive. We have to highlight the low access time of 16.9 milliseconds. Although the hard drive reaps in good rates, it is absolutely inappropriate for the laptop's purchase price. HP should offer more here. We would have expected at least a 7200 rpm hard drive, a hybrid hard drive, or a small SSD. Intel's HD Graphics 4600 GPU is responsible for video output. It supports DirectX 11.1, and clocks with speeds ranging from 200 to 1150 MHz. The ProBook wins the 3DMark benchmarks. This is surprising at first because the ThinkPad Edge (Core i3-4000M, HD Graphics 4600) sports the same GPU. However, the reasons for this are soon found: The ProBook's graphics core clocks with a somewhat higher speed and HP's laptop also benefits from its stronger CPU. The TravelMate (Core i5-4200U, HD Graphics 4400) lags behind its contenders because is features the weakest graphics core. The ProBook's hardware allows for playing many current games smoothly using at least a low resolution and low quality level. Higher resolutions or quality settings are even possible when a game only has moderate requirements on the hardware, for example in the game StarCraft II. The frame rates can be increased a bit. The laptop would operate in dual-channel mode when a second working memory module is installed. This would better exploit the GPU and supply higher frame rates. An average increase of up to 20% is possible. Users who want to play regularly should keep a lookout for a ProBook model with a dedicated Radeon HD 8750M graphics core. We could not discover a corresponding model at the time of this test. An alternative would be, for example, Dell's Latitude 3540. Some versions offer a Radeon HD 8850M graphics chip. The idle noise development is within limits. The hard drive is only heard when accessed. Although the fan runs permanently, it is only really audible in quiet surroundings; it first speeds up considerably during full load. The noise level is still tolerable though. The TravelMate proves to be the quietest device, which is not surprising since it sports an energy-efficient ULV processor. The ThinkPad Edge also produces less noise since Lenovo's laptop operates with two CPU cores less than the ProBook. 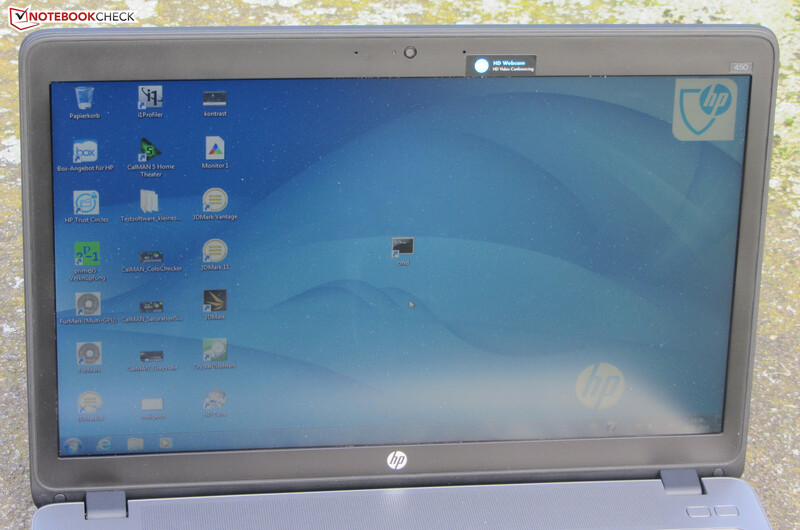 HP's ProBook 450 in the stress test. None of the three comparison laptops heat up notably in idle mode. The temperatures were within an acceptable range at all measuring points. 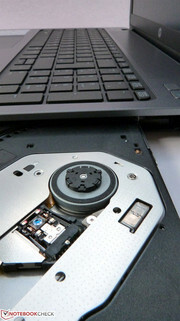 The ProBook only heats up moderately in most areas during load. It only surpasses 50 °C at the measuring point in the fan's area. 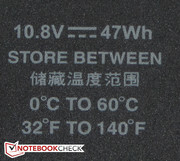 The temperatures of both the ThinkPad Edge and TravelMate remain below 40 °C at all measuring points. 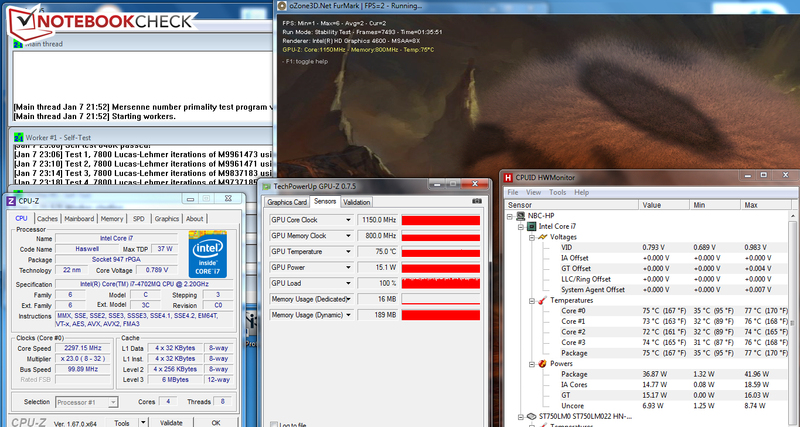 The CPU performed the stress test (Prime95 and Furmark run for at least one hour) with 2.4 GHz in AC mode. Recurrent peaks of 2.3 and 2.5 were recorded. The CPU ran stably at 2.2 GHz when the stress test was performed in battery mode. The graphics core always ran at full speed (1150 MHz). The stress test presents an extreme situation that does not occur to such an extent in routine use. Even if the processor barely used its Turbo in the stress test, it does in routine use as our performed benchmarks prove. The CPU's temperature settled to approximately 75 °C in AC mode (stress test). The processor always operates with a maximum of 2.2 GHz in battery mode. Therefore, the Cinebench benchmarks scores are, for example, lower than in AC mode (Cinebench R11.5 single: 0.97; multi: 4.79). (+) The maximum temperature on the upper side is 37.1 °C / 99 F, compared to the average of 33.9 °C / 93 F, ranging from 21.2 to 62.5 °C for the class Office. (-) The average temperature of the palmrest area of similar devices was 28.2 °C / 82.8 F (-8.6 °C / -15.4 F). 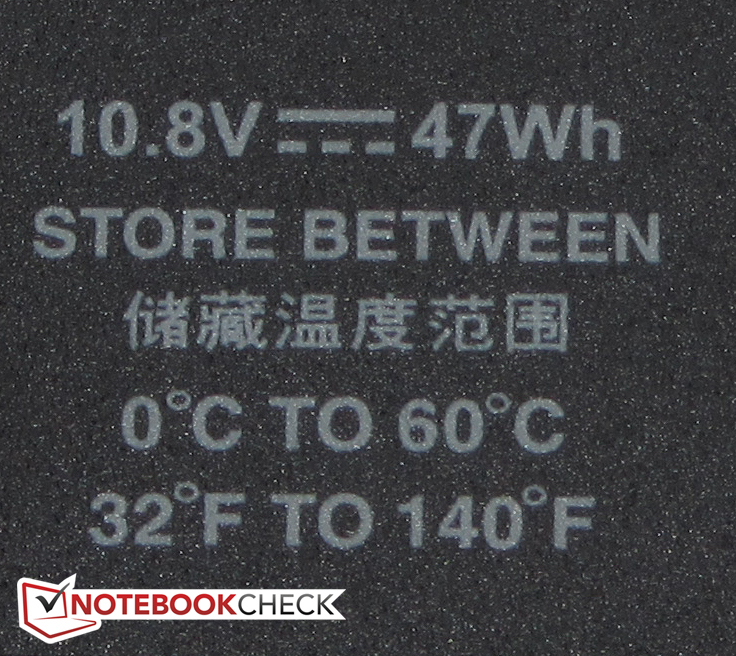 With an idle power consumption ranging from 6.3 to 8.8 watts, the ProBook proves to be very frugal despite its high-performance quad-core processor. The ThinkPad Edge (5.4 to 7.9 watts) supplies somewhat better rates, and the TravelMate (4.3 to 12.7 watts) consumes more power. This is surprising because the laptop features a ULV CPU. The ProBook has the highest power requirement in medium load with 41.6 watts via 3DMark06, and 58.2 watts during the stress test via Prime95 and Furmark. After all, a Core i7 quad-core processor is installed in the laptop. 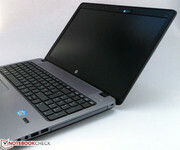 Although the ProBook sports a standard mobile processor (not ULV) with four cores it supplies good runtimes. The Probook's battery lasted for 9:39 h in idle mode. The TravelMate shut down earlier (8:13 h). We did not perform this test with the ThinkPad Edge. Idle mode is ascertained using Battery Eater's Reader's test. The screen is set to minimum brightness, the energy saving profile is enabled, and the wireless modules are off. The ProBook achieved a load runtime of 0:59 h. The TravelMate is on par with 1:05 h, and the ThinkPad Edge did a better job with 1:31 h. The load runtime is ascertained using Battery Eater's Classic test. Here, the screen works with maximum brightness, the high-performance profile is enabled, and the wireless modules are on. The ProBook stopped the Wi-Fi test after 4:48 h. Thus, it lasts longer than both the TravelMate (4:30 h) and ThinkPad Edge (4:23 h). Websites are opened automatically every 40 seconds, the energy saving profile is enabled, and the screen's brightness is set to roughly 150 cd/m² for this test. The ProBook shut down after DVD playback after 3:10 h. It places itself between the TravelMate (3:34 h) and ThinkPad Edge (3:03 h) with that. The DVD test is performed using enabled energy saving profile (or a higher profile should the DVD not run smoothly), maximum screen brightness, and disabled wireless modules. 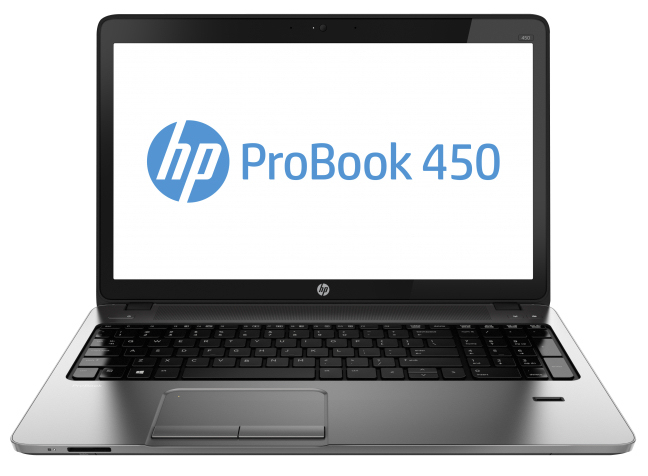 HP's ProBook 450 G1 E9Y58EA provides high application performance and operates quietly. The battery runtimes are also very good. HP has also installed decent input devices in the ProBook. Beyond that, we like the tool-less opening of the maintenance cover. However, HP manages to ruin the rating by installing an unacceptable screen. It has a bluish cast, low contrast, and is only averagely bright. A laptop for a little less than 800 Euros (~$1099) should have more to offer. The one-year warranty is also too short. Users who do not depend on a strong Core i7 processor could turn to the ProBook model with a Core i3-4000M processor and save about 200 Euros (~$274). Lenovo's ThinkPad Edge E540 stands out with its very good input devices, and its price is also quite reasonable. The 20C60043GE model features a Core i5-4200M processor, and costs approximately 520 Euros (~$714) - but does not include a Windows operating system. Acer's TravelMate P455-M scores with a matte Full HD screen, and always operates quietly. The laptop features good input devices. The lid's back is rubber coated. 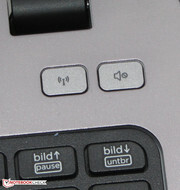 There are two dedicated buttons for turning the wireless modules and speakers on and off. ...supplies a capacity of 47 Wh. The DVD burner reads and writes all kinds of DVDs and CDs. The burner can be removed. The decent application performance and the easy-to-open maintenance cover. A brighter, higher contrast screen. Even many laptops from the budget sector come with better screens than the ProBook. Lenovo ThinkPad Edge E540, Acer TravelMate P455-M, HP ProBook 455 G1, HP ProBook 450 G0, Dell Latitude 3540, HP ProBook 650, Test Wortmann Terra Mobile 1529H, Lenovo ThinkPad S540, Fujitsu Lifebook A544, Acer Aspire E1-572, Fujitsu Lifebook E753.